Ready to push those New Year's resolutions back for another year? Great! We are too. 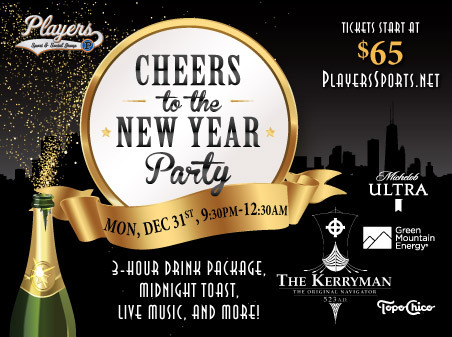 Plan that pucker in advance, tune up the vocal chords for Auld Lang Syne, and head to The Kerryman Chicago in River North to say "what's up" to 2019. Featuring a drink package with three-hours of all-you-can-drink, that ever-so-mandatory toast at midnight, live DJ, free swag, and more! - 3-hour drink package with beer, wine & well drinks! - A Midnight toast to welcome 2019! - Free swag & more! Are there ID or minimum age requirements to enter the event? Yes! All party-goers must be 21+ to enter The Kerryman Chicago. Please have a valid photo ID ready at the door. What are my transportation/parking options for getting to and from the event? If you are driving, we suggest using a parking app for discounted parking spots surrounding The Kerryman Chicago. Even moreso, we HIGHLYsuggest ridesharing, carpooling, and public transportation. There are two CTA stops within walking distance of The Kerryman Chicago! The Brown Line and Purple Line drop off at Superior and the Red Line drops off at Grand and State! How can I contact the organizer with any questions? Feel free to email events@playerssports.net with any questions you may have! What's the refund policy? Pretty easy - no refunds. Do I have to bring my printed ticket to the event? Nope! We're big fans of 'Going Green' and are even bigger fans of the Eventbrite app! You're welcome to access your electronic ticket via your email or even the Eventbrite app. Just whatever you do, please have your ticket ready upon entry - don't be THAT person. Is my registration fee or ticket transferrable? Yes & no - registration fees are nontransferrable, but it's super easy to transfer your ticket to someone else! Just email events@playerssports.net. If transferring, you will need to provide the first & last name and email of the guest who will be attending. Is it ok if the name on my ticket or registration doesn't match the person who attends? For sure! As long as we can scan you in, we don't care who bought the ticket.